With life getting super busy, I am always looking for little changes that will alleviate a lot of the pressure to maintain not only my health but also uphold my appearance. Hair plays an important role in looking good and it’s one of the first things people notice when they look at you. Styling could take a lot of time and going to the hair dresser might not always be an option. I am fortunate to have very long wavy hair, because it kind of has a will of its own. If I shower and leave my hair to dry naturally, the waves give it some nice texture and volume while the heaviness, due to the length, kinda drags it down so it doesn’t stand like a lion’s mane. So pretty much easy. But when I use harmful products on my hair, it could look unkempt and well… crazy! I am not a huge fan of salon-finished hair, because it seems a tad too heavy, oily and for lack of a better word, clumpy. 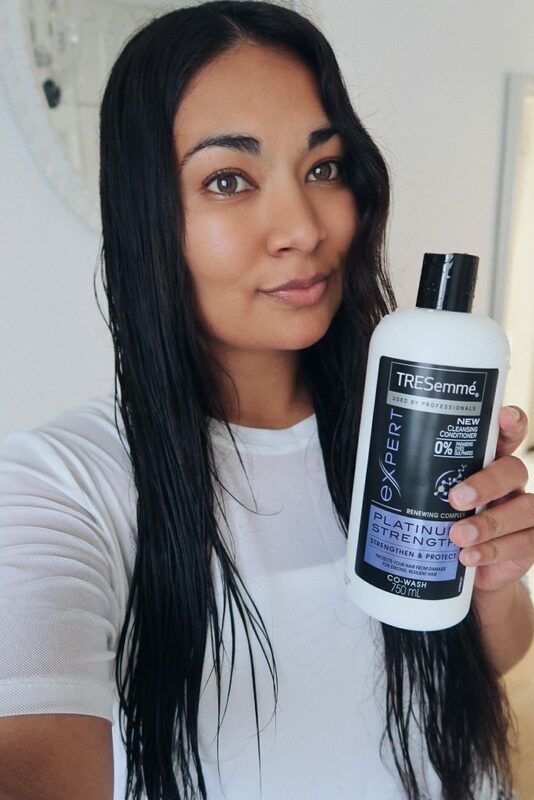 When it comes to TREsemme, I’ve always had a bit of a love/hate relationship. In school, I felt the products didn’t really work with my hair. After damaging my hair over the years, from colouring and heat styling… I feel the products work wonders. TREsemme has become one of my favourites and they are always evolving and enriching their formulae. The brand-new product Co-Wash (Cleansing Conditioner) just launched and with the help of RubyBox, I was one of the first to try it out. I was a little confused the first time I tried it because I thought it was basically a 2-in-1 Shampoo and Conditioner but it is a little more than that. If you’re like me and wash your hair every 2 to 3 days, you know that you scalp will produce more oils, leaving your hair feeling a little heavier. But instead of washing your hair with harsh chemicals it is better to use products that are less harsh and helps restore the natural oils and nutrients in your hair. It is a great ‘in-between washes’ kind of product to clean a little more gently. It does tend to feel a bit heavier as it does not remove the access oils as thorough as Shampoo would normally, so if you’re on 3-5-day hair… it’s not great, but if you’re on 1-2-day hair, it’s superb. My hair feels soft, moisturised and extremely shiny! I would most definitely be re-buying this product once I’ve eventually run out. Also, it is affordable and last for over 15 washes, even with me long hair. With all of this said, I would like to give you an opportunity to win a bottle of TREsemme so that you can try it as well. Comment Below what your hair concerns are. Competition closes on 1 October 2018. Congratulations Mercy Oke!!! You’ve won! Please send you postal details to tazz@bonafide.blog so we can send you a full-sized bottle for you to try. That’s crazy! Something more gentle might just be what you need!